Are you looking for the best action camera for motorcycles? Whatever your reasons for wanting one—be it for vlogging or your safety—you would need a camera that can promise excellent video quality. After all, it is what would make or break your entire project. The good news is that there are plenty of worthy options to choose from. These days, action or sports cameras are among the most popular cameras. In fact, it has one of the largest market shares, providing you with plenty of brands and models to compare. Now, the challenge is, there are too many action camera models currently on the market today. As a result, it can be very difficult for a common person to find the best one that would suit their unique needs. Lucky for you, we are here to help you out. From hundreds—if not thousands—of action cameras, we have narrowed it down to the three best options. Below, we have listed down each of their features, pros, and cons in order to help you decide which one is the best action camera for motorcycles. 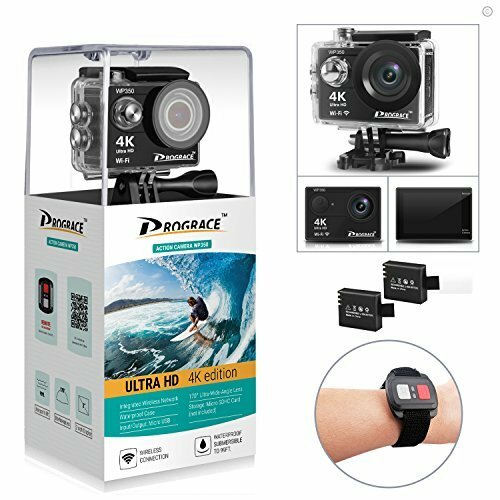 The Drograce WP350 is a 4K Ultra HD video action camera that allows you to shoot videos in different settings. It comes with 25 install packs combinations for multi-purpose use including helmet camera while driving and video recording up to 100 feet underwater. The package comes with a waterproof case for this purpose. With its two rechargeable 1150 mAh batteries, you can enjoy more than three hours of uninterrupted video recording. It boasts two different video quality and recording options: 4K/25fps or 1080P/60fps. It can take 12 MP high-quality photos too, thanks to its Sony sensor. Inside this camera is a 170-degree optical glass lens with six layers, allowing you to capture a wide area. When it comes to connectivity, this camera has multiple options that make it easy to record, store, and edit videos. In fact, it has everything from a built-in WiFi to HDMI compatibility. Another remarkable feature is its 2.4GHz remote control that comes in the form of a wristband. Alternatively, it can also be controlled using your smartphone via its Android and iOS apps. A two-inch LCD screen is also added so you can keep an eye on your recording easily. This camera is pretty compact too, measuring only 1.5 by 0.9 by 2 inches. 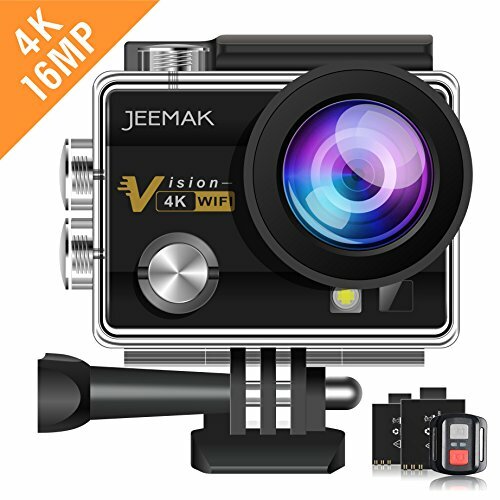 The JEEMAK Action camera, similar to the previously reviewed action camera, is also a 4K Ultra HD video recording camera with 16 MP photo capability. It allows you to choose from five different video recording options that include 4K/30 fps, 2.7K/30fps, 1080P/60 fps, 1080P/30fps, and 720P/90fps. For your convenience, it also comes with 2.4GHz remote control, which allows you to control the camera from a distance, and built-in Wifi so that you can use it with your phone. It comes with mounting accessories that make it very easy to attach to your bike. Other than for driving, it is also designed for underwater use such as for scuba diving, swimming, and surfing. Since this camera is waterproof, this also means you can record video while on your motorcycle under heavy rains. It features several recording modes that include driving mode and loop recording. The package includes two rechargeable batteries that offer hours of video recording without any interruption. 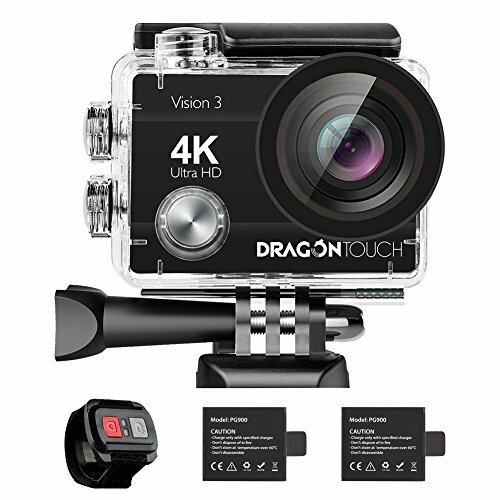 The Dragon Touch Vision Vision 3 is a 4K Ultra HD camera with 16 MP Sony Sensor Vision 3. It boasts a wide view-angle of 170 degrees, which allows you to capture more action when you are driving. Aside from that, it is also equipped with a driving mode. This setting allows you to use this camera with a motorcycle or as a dashcam for your car. Other features include image rotation, loop recording, and time-lapse. The last feature makes it possible to record in slow motion or faster. Like the other two models we discussed above, the Vision 3 is also a waterproof camera, boasting a limit of 30m for recording underwater. In addition to keeping it safe from water, the waterproof case also blocks pollution and dust. The Vision 3 comes with built-in Wi-Fi, and very easy to use Android and iOS apps (XDV app). It also allows you to connect with the wireless remote control wristband, your smartphone, your computer using USB, or your TV using HDMI technology. Some other prominent features include 4x zoom, slow-motion recording, burst photo option, and sound record option. As mentioned before, all three of the options are some of the top action cameras to use while driving. However, each one comes with a unique set of features, as well as pros and cons. Looking at each action cameras, which one do you think is the best fit for you? For example, if you want to choose between multiple recording options, like 4K and 1080P, the JEEMAK is a better choice with its three different options. The JEEMAK also offers you better-quality 16 MP photos compared to the other two. On the other hand, the JEEMAk is also the heaviest on our list. If you want a lighter camera with a compact design, the other two are good options.